Data Sense is a much touted feature of Windows Phone 8, and a very nice one theoretically, which tracks every byte of data by every single app (including the phone OS itself) over both cellular and WiFi. But most Windows Phone 8 devices on the market these days do not have it on board yet. The reason of its absence, as we've heard, has something to do with lack of carrier support. AT&T is said to be adding Data Sense to its devices in the near future, but other Windows Phone carriers are more or less remaining quiet on the subject. 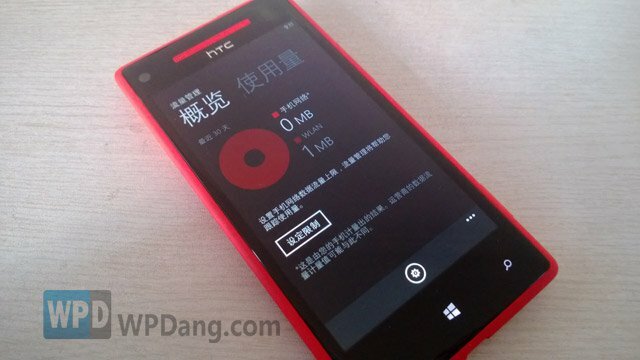 Surprisingly, China Unicom is already selling HTC 8S and HTC 8X Windows Phones with Data Sense pre-loaded right now. Actually, out of all major Windows Phone 8 devices in the Chinese market, Data Sense only exists on HTC phones for China Unicom. The Lumia 920T for China Mobile doesn't have it, all HTC and Nokia devices from Hong Kong don't have it, and seemingly Huawei's Ascend W1 doesn't have it either. This makes China Unicom devices considerably more competitive than others. Chinese technology website WPDang had a Data Sense test run on a China Unicom 8X, finding the feature working exactly like it should. However, Data Sense doesn't seem to need any carrier support in reality: users are required to set up billing cycle and data limit manually, and it even states on the screen (the last two lines, as shown in the lead picture of this post) that "The data counter is generated locally on your phone, which may not be the same with statistics on the carrier's end". Switching cellular network doesn't cause visible impact to Data Sense, if any. Replace the China Unicom SIM card with one from China Mobile and the feature works just as well. This makes us wonder that if Data Sense, or the part of Data Sense that matters most, works entirely from the device, why are phone manufacturers ripping it off from most devices in the name of "lacking carrier support"?